Craving for a fix of angsty, superficially deep Tumblr-Twitter-Instagram-esque poetry? Check out Amanda Lovelace’s work. 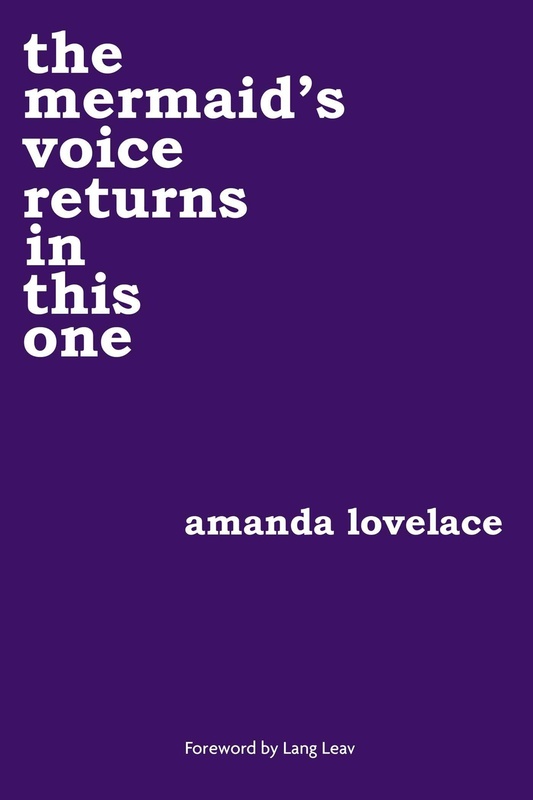 “the mermaid’s voice returns in this one” is the third poetry collection in Lovelace’s “Women Are Some Kind of Magic” series, following “the princess saves herself in this one” and “the witch doesn’t burn in this one,” all of which attempt to spin classic fairytale imagery and tropes into modern messages of female empowerment. Lovelace’s project of portraying women as resilient and powerful is a noble one and her personal experiences with various internal and external struggles that inspired her writing should not be criticized themselves. But “the mermaid’s voice returns in this one” is a lackluster body of poetic work. In truth, “the mermaid’s voice returns in this one” sets lofty ambitions for tackling complex subject matters, but ultimately fails to achieve them with brief, choppy poems that disguise their lack of substance behind quirky line breaks and language so prettily vague that it parades as true depth. Lovelace breaks up her collection into four distinct parts — I. the sky, II. the shipwreck, III. the song, and IV. the surviving — that sketch out a loose trajectory for her narrator’s tale of healing and learning self-love after exiting a destructive, abusive relationship. The collection opens with a foreword by novelist and poet Lang Leav, and features a few works from guest poets such as Nikita Gill and K.Y. Robinson that fit with the overarching motifs of oceans and princesses. Lovelace’s style is exceedingly popular among amateur poets across social media platforms: free verse, short lines, no capitalization, simplistic word choice. As this way of writing blatantly seeks to provocatively subvert both poetic tradition and the rules of grammar, it paints Lovelace’s work as trying too hard to seem original. This makes it even more obvious when her poems fall short of ingenuity, such as when she writes plainly, “i don’t write / what i write / to hurt you.” Further, if normal capitalization were restored and the line breaks were taken away from a poem like “at / this point, / staying / with you / is nothing / more / than / muscle / memory,” readers would realize that Lovelace’s collection is essentially broken-up prose, generic statements that could have been snatched from any novel or blog post. The aesthetic format merely creates a cloak of false meaningfulness around words that would be too simplistic and literal to stand on their own. Upon further analysis of the actual content of Lovelace’s poetry, there isn’t much to be found. She frequently throws out barrages of images and snippets of scenes — “a smile. / irresistible lashes. / a dark room. / legs tangled. / peace” — through this she raises tensions without fully resolving them, signaling a lack of clear direction in her writing and making her poetry frustratingly unsatisfying. Considering how brief Lovelace’s poems are, with many weighing in at under 30 words, relying on fleeting images to carry the writing without giving sufficient context or explanation is lazy. Still, although her poetic techniques are lacking, Lovelace has the chops to be a writer of fortune-cookie fortunes — she skillfully presents vagueness such that it can be misconstrued as a universally relatable truth of life. Moreover, on the rare occasions where Lovelace actually makes an argument for her opinions and beliefs rather than tossing out images for her readers to dissect, she merely rehashes popular public sentiment concerning a given social issue without adding anything new to the literature about the topic. For example, in her poem “hooks encrusted in sand,” Lovelace takes a stance against gun violence at schools, painting an imagined utopia where “children / learn peacefully, / unafraid of / angry hands / around guns.” She portrays an oversimplified solution that doesn’t attempt to tackle the full complexity of the debate surrounding gun use, and essentially says, “But think of the children!”— hardly a point that hasn’t been made before across news sites and even phrased more poetically. It seems that Lovelace rides the high of people’s existing emotions regarding topical subjects in order to build a façade of social import while avoiding actually voicing a unique opinion in her writing. Lovelace’s poems are pleasant enough in sound and easy to comprehend, but after reading the collection, none of the words or images stick in the mind. Like cotton candy, the collection is quick and easy to swallow, especially for those who are intimidated by more traditional poetry, but provides no true sustenance for thought and quickly dissipates. Even if vague, “fake deep” poetry sounds appealing to you, skip on “the mermaid’s voice returns in this one.” Tumblr’s #poetry tag is teeming with similar fare, and get this: It’s free. —Staff writer Miranda Eng can be reached at miranda.eng@thecrimson.com.